The Renaissance of Gaming: From Homebrew to Heroic Brew! March 6, 2017 December 7, 2017 JohnGames / Gaming2 Comments on The Renaissance of Gaming: From Homebrew to Heroic Brew! When I set up this blog and started hunting for other blogs to follow and talk to, I found one where an avid blogger wrote about how they were disappointed that boardgames are not as popular as they used to be. I was staggered. I didn’t realise that some people didn’t know that boardgames appear to be going through something of a renaissance. But on the other hand, why should they? With folks getting their television from Streaming Services and Youtube, there are fewer viewers of adverts, and truth be told I can’t recall the last time I saw a decent gaming advert. So, if you aren’t looking for them, maybe boardgames are less obvious than they used to be. However, despite that, I have to say there has never been a better time (for me at least) to enjoy gaming as a hobby. I think there are a number of reasons for that. Roleplay Games have been around for ages, as have their players. And now, you have a generation of adults who played Dungeons & Dragons when they were kids, who now teach it to their kids. Not only is there a continuation of players, there is also a group that might in some realities qualify as gaming aristocracy. Or maybe gaming oligarchy? Who knows? The point being there are folks in the adult generation who understand the appeal of rolling dice, moving miniatures and pretending to be something they aren’t. Which means there are more folks to encourage gamers, and less discouraging views. Which creates a demand, an increasing number of players which games manufacturers are happy to fill. Never underestimate the power of nostalgia. I have briefly mentioned in other posts about Pathos in classical rhetoric. Pathos is one of the three pillars of rhetoric, and specifically refers to the emotional appeal. The emotional appeal in this case reconnects adults, who have busy responsible lives, to a time when they had fewer stresses and freedom to spend any given saturday to playing games and watching repeats of Airwolf. Nostalgia is also a large contributing factor the large number of the so called First Generation still fond of their childhood hobbies. Games may no longer frequent our TV screens, however they have their own substantial corner of Youtube and other online services. When I was trying to decide whether or not to buy Twilight Imperium (Left) I spent many hours scouring youtube for any videos I could find about the game. I wanted reviews, I wanted to know how to play, I wanted it all. Which is perfectly reasonable, given how pricey the game actually is. After finding a couple of videos that explained how to play, I realised the play style and complexity would appeal to me so I took the plunge. Quite possibly my favourite video on youtube right now! Broadsword! Games are significantly more sophisticate than before. Once upon a time it was everyone for themselves, down to and including 1 vs 1 such as in chess. But you have lots of different types now, and I am only going to scratch the surface of them here. Asymmetric Games – that is one person versus everyone else. Heroquest was a good example of that, with one player taking the role of Morcar, the evil wizard. Descent is similar in that there is an Overlord, and Fury of Dracula has Dracula himself. I love leading the Vampire Hunters a merry chase around Europe. Well, merry for me, at least. These games hark back to the likes of Dungeons & Dragons where a Games Master is required and have a bit of added nostalgia value. They also have the added element of a human opponent, which means there is a contest, a battle of wills between players which can be quite fun. I particularly like revealing my outrageous trap cards to heroes in Descent, just after they spent 5 minutes plotting exactly how they were going to move their characters and milk their movement for all they were worth. Getting inside the player’s heads when you are playing a hidden movement game, such as Fury of Dracula, is simply glorious. Player 1: He’s probably in Iberia! Player 2: Yeah, he could have got a boat from the UK! Player 3: He also used roadblocks on us to slow us getting into Spain! Player 4: Has anyone noticed how much terror he has accumulated whilst we’ve been chasing him? Progression Games – and by this, I mean games that players have a choice about how to play their part and develop their play style. Descent springs to mind again, as each player levels their character up with Experience gaining new skills along the way. They also have the opportunity to buy better gear along the campaign trail which forces a choice:- Do they hurry and complete the quest before evil wins, or stop off and loot the treasure room? Twilight Imperium also does this to an extent, as players choose strategies every turn, between politics, trade, warfare and research. The strategy dictates what special stuff you can do on your turn and if you choose poorly, you might be hamstrung for the next two turns. Choose well, and you might have a Warsun over Mecatol Rex in turn 7 (A Warsun is a NOT Deathstar spacecraft, Mecatol Rex is a NOT Coruscant galactic capital). The point being that if you are involved in your play, your game, then it becomes that much more immersive. Involvement of the participant is something I studied at Uni, when studying Graphic Novels (I was so up for the class debate if someone dared to say Graphic Novels aren’t literature…). Involve the viewer/reader/gamer and you get a loyal participant. 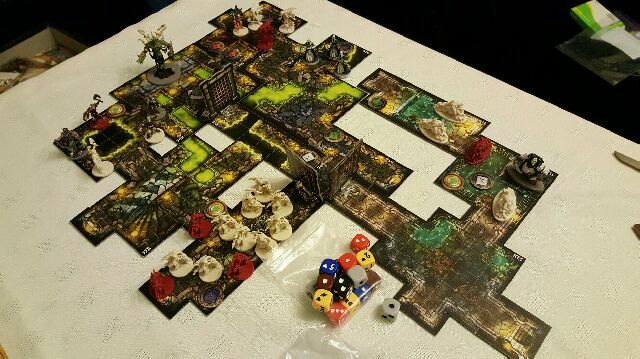 One of my mates has a game concept that we played a couple of weeks back. A post apocalyptic survival game, where players make up a caravan/convoy that are scavenging for supplies. Using raw materials that are akin to the backs of cereal packets, this friend of mine had built a modular map system (with some familiar locations…) and created a deck of entertaining monsters and hazards (I am spoiling nothing). The game was straightforward, and in some respects too easy, but it played similar to Zombicide and I can see the potential for it. I daresay I will still have conversations with people in the future who see gaming as limited to Monopoly and Chess. It doesn’t really matter. My hobby is secure, and it helps me keep my brain in the creative place I want it to be.